Pullups strengthen your arms, shoulders and back. If you're looking to increase your upper-body strength, pullups are a simple and effective choice. Requiring only a well-anchored bar and your body weight, pullups let you work many muscles in your arms and back, including portions of your deltoids. Because of the motion involved, pullups do not exercise the front, or anterior, deltoids, but similar exercises will allow you to strengthen this region of your shoulders. The deltoid muscle is one of the major muscles of the shoulder and extends over the joint between the humerus and the collarbone. The deltoid can functionally be divided into three sections: the posterior, lateral and anterior deltoid. The posterior deltoid is involved in extending and laterally rotating the arm. The lateral portion abducts the arm, meaning it pulls the arm toward the body. The anterior deltoid is responsible for arm extension and medial rotation. The most basic version of the pullup involves having the hands shoulder-width apart with the palms facing away. You can also modify the pullup so your hands are further apart, which emphasizes the latissimus dorsi muscle, or so that your palms are facing you, which will emphasize the biceps more. The main muscle group exercised by the pullup is the lat muscle, though the deltoid also acts as a synergistic muscle, meaning it helps with the action. However, the part of the deltoid pullups work is the posterior, not the anterior deltoid; no form of pullup targets the anterior deltoid. Because the basic pullup, which involves exerting a downward force on the body, exercises the posterior deltoid, it should come as no surprise that to exercise the anterior deltoid, you need to exert upward force -- the posterior and anterior deltoid have opposite functions. Many exercises that involve pushing a weight upward, such as the behind the neck press, shoulder press, front raise and military press, involve the anterior deltoid muscle. So if you're looking to work your anterior deltoid, these options are similar to a pullup but require the opposite motion. To help prevent injuries, avoid overworking your muscles when you strength train. 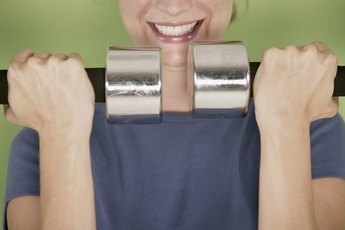 If you are doing pullups, Military.com recommends only doing them three days a week rather than every day to give your muscles a chance to recover. 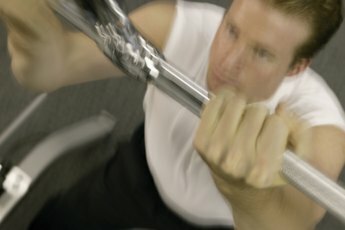 Before you begin any new sort of exercise routine or lift, talk with an experienced lifter or trainer to understand proper technique so you don't injure a joint or muscle.